Supporters of the pro-Kurdish People’s Democratic Party (HDP) clashed with police during an anti-government protest in Istanbul on Saturday. 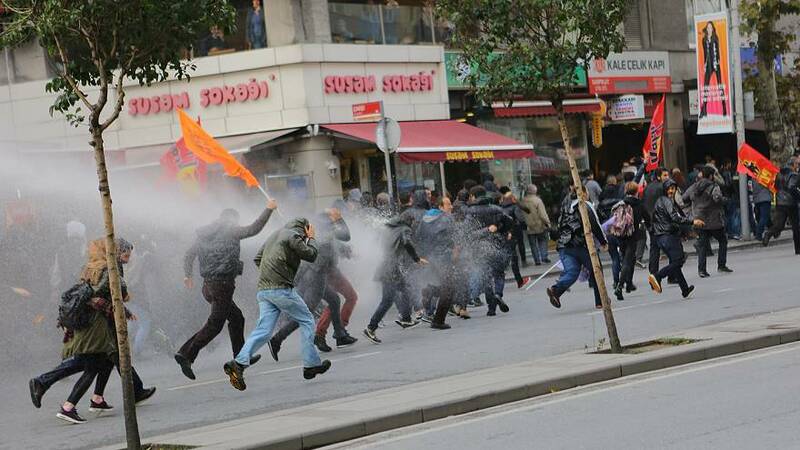 Turkish police fired water cannon and tear gas. A Reuters reporter at the scene described tear gas filling some streets in the Sisli neighbourhood of Istanbul. The protest in central Istanbul came hours after Turkish authorities ordered the formal arrest of nine staff members of the opposition newspaper. More Kurdish officials have been arrested, widening an anti-terrorism inquiry that has drawn condemnation from the abroad. Around 6,500 Kurdish supporters demonstrated peacefully in the German city of Cologne on Saturday. They criticised Germany for not doing enough to stop Erdogan’s government from detaining and suspending officials, including judges, teachers, police and civil servants in the wake of a failed military coup in July. The demonstrators are also protesting the arrest of 12 pro-Kurdish lawmakers on Friday by Turkish authorities. Those arrested included HDP co-leader Selahattin Demirtas, Turkey’s state-run news agency Anadolu reported. The agency says Demirtas has been taken to a maximum security prison in the northwestern city of Edirne. The 12 party legislators were detained for refusal to testify on terror-related charges, according to Turkish officials. The HDP is Turkey’s third-largest party. It made history last year by becoming the first Kurdish-rooted party to win the 10% of the vote required to enter parliament. Erdogan and the governing AK Party accuse the HDP of links to the outlawed Kurdistan Workers Party (PKK), which has carried out a violent insurgency in Turkey’s mainly Kurdish southeast for three decades. The HDP denies direct links and says it is working for a peaceful resolution of the Kurdish conflict.